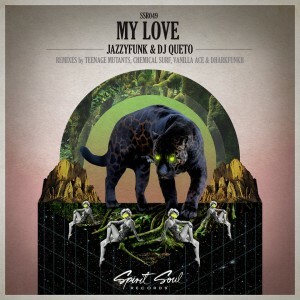 First ep with JazzyFunk & Dj Queto. Oh lord what a banger!! The FAB vocals are from JazzyFunk who we soon will see rise to the sun. This is one of his characteristic touch with a blend of smooth vocals, suiting melodies and the deep house touch we all love. My Love will bring you instant summer in the middle of the winter. First out we see a remix by Teenage Mutants. He needs no introduction to the game and his remix is kinda sick. Start out slow and throttling to expand later on in a crescendo of smile and happiness. Oh Lord the break, we love the break ! Second out are the duo Chemical Surf. They once again focus on the melodic parts but don’t get fooled. This remix got more attitude and ruff twists overall. Accomplished with the vocals this is a sure shot. Last but not least we have Vanilla Ace & dharkfunkh. From the get go we focus less on melody and more on strategy. You will find yourself tip toeing for the next push. But when it touches you you stuck gold once again. We are sure there is a remix for everyone.